Is dog crate training going to be difficult? Not necessarily, but you'll have to begin from scratch and he may be a little harder to crate train than a puppy, but it’s certainly not impossible. Learn how here. Who said you can’t teach an old dog new tricks? 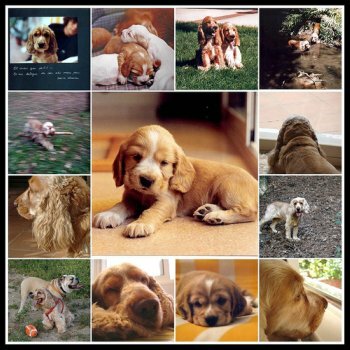 The success to crate training a dog is not to rush - take it slowly! If your Cocker Spaniel has never been in a crate before, I recommend you begin his training from scratch. The same will apply if he's had any previous unhappy or frightening experiences in a dog crate. Depending on the circumstances, (he's been re-homed, he was a rescue dog, unpleasant memories of a crate) crate training could take up to 3 weeks. Don't rush your dog, allow him plenty of time to get used to his new cage. Take one step at a time, and move on only when you feel he's ready. 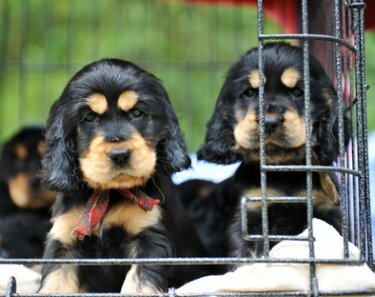 The instructions for dog crate training are very similar to those for crate training a puppy, and before I begin to explain further, I heartily recommend that you read the essential rules of crate training to give you a bit of background information and an idea of how to approach it. Dog Crate Training: A Room With A View! Decide where you're going to place your dog's new 'den'. In my opinion, the best place would be in an area where he can see what's going on, but not so noisy that it would disturb him if he's sleeping. An ideal place would be in a quiet corner of the room, away from any draughts, and because it's in a corner, it will make your Cocker's space feel cosy and den-like. If you don't have a spare corner, the next best thing would be to drape a towel over the top of the crate, leaving the entrance open. Place one of his 'fragrantly scented' blankets into the bottom of the cage to help make it feel more comfortable and smell more like 'home', throw in his favourite toy and a couple of training treats and leave him to if for a while. With a bit of luck, this may be enough to tempt him to go inside! Dog Crate Training - Step 1: Going In And Out! After a few days of wandering past or sniffing his crate, and he's still not going inside, it's now time to begin the training. Ask your pet to sit by his new home. He may automatically step inside; if he does, praise him and give him a treat - it's looking good! If he appears wary, place a treat on the floor at the entrance and another just inside to tempt him in. When you're adult dog crate training, your main objective is to help your dog to recognize that good things happen to him when he's in or around his cage and that he has nothing to be afraid of. Next, throw a couple of treats into the back of his crate so that he must step inside to reach them. If he goes inside, praise him. Don't close the door at this stage otherwise you may startle him. Practice this a few times until your Cocker seems comfortable with going in and out of his cage. At your next training session, place some treats into his cage to tempt him back inside and as he's finishing his last treat, call him to you. As he comes out, praise him and give him a small treat and lots of cuddles. After trying this exercise a couple of times, begin rewarding your dog with praise only for coming out of his crate when asked; don't reward him with treats. Treats should now be reserved only for going inside his crate. If your Spaniel leaves his crate without being asked, don't praise him. Because your pet is older, he's probably been trained so he will understand the basic puppy obedience training commands such as sit, down, stand, etc. which can be very useful at this stage of his training. When your pooch is happily entering and leaving his crate, begin using the words "into bed" (or whatever words you prefer) just as he's stepping into it. As with most dog training, timing is crucial. Voice the new command just as he's stepping inside to help him associate the command words "into bed" with going into his crate. After a few training sessions where you've used your new command, if you haven't done it already, drop the use of treats. 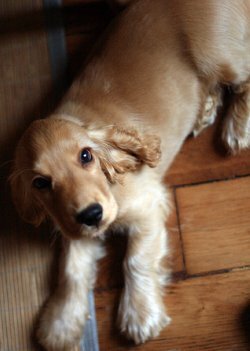 You now want your Cocker Spaniel to enter his cage because you've asked him to, not because he's been 'bribed' with a treat! If he doesn't do as you've asked, just wait and see if he eventually goes inside. When he does, praise him enthusiastically to let him know that he did exactly what you wanted him to do. If he doesn't make a move, simply end the training session and try again later. Never try to force your Cocker Spaniel to go into his crate. When dog crate training, you will need to have lots of patience and take things slowly! Repeat the above sessions a couple of times each day and your pooch will soon be trotting in and out of his cage on command. Your next exercise in dog crate training involves closing the door for a few seconds while your Cocker is inside. Scatter several small treats or a favourite toy into the crate, preferably at the back, and give your pet the command to go inside. As he does so, close the door behind him. The treats will keep him occupied for a few moments. As soon as he picks up his final treat he may turn around and move to leave. If this happens, open the door. Don't forget, you should no longer be rewarding your Cocker for going in or leaving his crate. However, if he comes out and you didn't ask him to come out, don't praise him. After practicing closing and opening the door a few more times, repeat the exercise but this time leave the door closed for 30 seconds after he finishes the last treat. He may paw at the door or whine to be let out. If he does, feed him a treat through the bars to settle him down and before opening the door. If you let him out when he's whining, or pawing at the door, you will be reinforcing his belief that this behaviour will get him what he wants. Never respond to such attention seeking behaviour, particularly when training! Practice the above until you can leave your Cocker locked inside his crate for a few minutes and then gradually build on this until he can tolerate being locked inside for longer periods. To help get him used to being in his crate for longer, you might like to try feeding your Cocker inside his crate. If he knows he's about to be fed, it will definitely entice him to use it more often. Simply place his dish inside and leave him to it! Once he's in, and eating, close the door behind him. If he's hungry enough, he won't object, he'll simply eat his meal. If you think he's uncomfortable and wants to be let out, allow him to come out but remember not to praise him. Leave his food in the crate, when he's hungry enough, he'll probably go back inside and eat it. Keep an eye on him so that when he does return you can close the door behind him. This part of the dog crate training may take several attempts depending upon how comfortable your pet is with the door being closed. Repeat the above at each mealtime but leave the door closed for longer each time. If he has a full stomach and he's comfortable, he may lie down and go to sleep. Now that's a definite result! 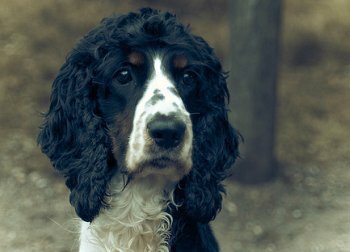 Don't forget to offset the treats against his daily food allowance, otherwise you may end up with an fat Cocker Spaniel and you certainly don't want that because overweight dogs are much more prone to health problems! Dog Crate Training - Step 4: Home Alone! A well-behaved, fully house-trained pet won't really need to be locked inside his cage. But until then, it will be necessary to lock him in his crate. Before you do this, it's important that your adult Cocker is familiar and comfortable with being alone, and being locked inside his cage. Let's begin! Ask your Cocker Spaniel to get inside his crate and then close the door behind him. Stay in the same room so that he can see you. Do a bit of ironing (yuk! ), have a coffee or read a book, but let him see that you're still home. If you crate him while you're home, it will help to stop him linking being caged with being left alone. If he's comfortable, leave the room and return after 30 seconds. If he stayed quiet and seems comfortable, praise him and carry on with what you were doing. If you think it looks like he may want to get out, open the door before he begins to become unsettled or whines to be let out. If you can help it, don't set your Cocker Spaniel up to fail. You may need to practice this part of his dog crate training many times during the day, gradually increasing the time you stay out of the room and he stays locked inside. With practice (and patience) you will be able to leave your pet alone inside his crate for a few hours, if necessary. 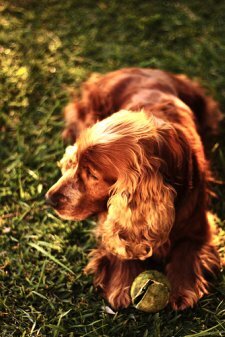 TIP: If you crate your Cocker Spaniel after his morning walk, or after an extensive play-time, he's more likely to stay inside his crate and rest. Who knows, he may even fall asleep for a couple of hours! You may like to try using some basic commands while you're crate training your dog and he's inside his cage. Rewarding him with a treat after each successful command will not only reinforce the obedience commands but will teach him that this is a great place to be! Try using the 'stay' command when he's next inside his cage. 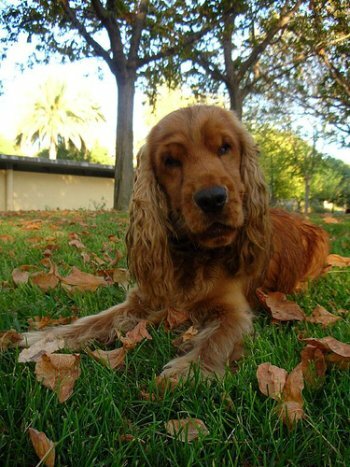 Ask your Cocker to 'stay' for 30 seconds or so and then release him. If he stays as requested, reward him. If he doesn't stay put, he's not ready to move on any further. You may have moved on too quickly and will need to go back and repeat the previous dog crate training sessions. When you believe he's ready, you can try again. Gradually increase the length of time you ask your pet to stay, but take it slowly - crate training a dog can take time and patience! Dog Crate Training: It Should Be Fun! Crate training a dog should be a relaxed and fun affair and shouldn't be stressful for either of you! It's best to keep your voice light and fun sounding, and don't use low tones as he may think he's being reprimanded or punished. One of the easiest ways of making crate training more fun is to make it seem like a game, and make it exciting for him. You can do this by occasionally hiding a few small treats (or even yummy homemade dog biscuits!) inside his dog blankets at the bottom of the cage and let him sniff them out. Placing his favorite toy in his crate or giving him a juicy bone to keep him occupied will make his crate a fun and interesting place to be. I hope this article has given you enough information to help you with your dog crate training and that you've been successful, without too many hiccups! I used a crate for Max when he was a puppy, and I still use it today but no longer lock him inside as he's fully house-trained and I trust him around the house. If I need to leave him, I simply put him inside his cage (door open) but close the kitchen door and that's where he stays. He goes into his cage until visitors are settled, then he's allowed to come out to say hello. He still occasionally uses it at night too, however, more often than not, he's on my bed! 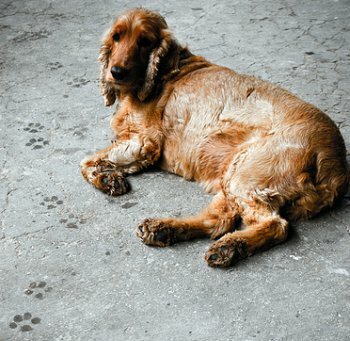 If your Cocker Spaniel is fully house-trained I'd recommend you do the same but don't forget to leave the door open so that he can get to his water bowl should he need to. If your dog or puppy isn't yet fully house-trained, you can learn about potty training puppy here.